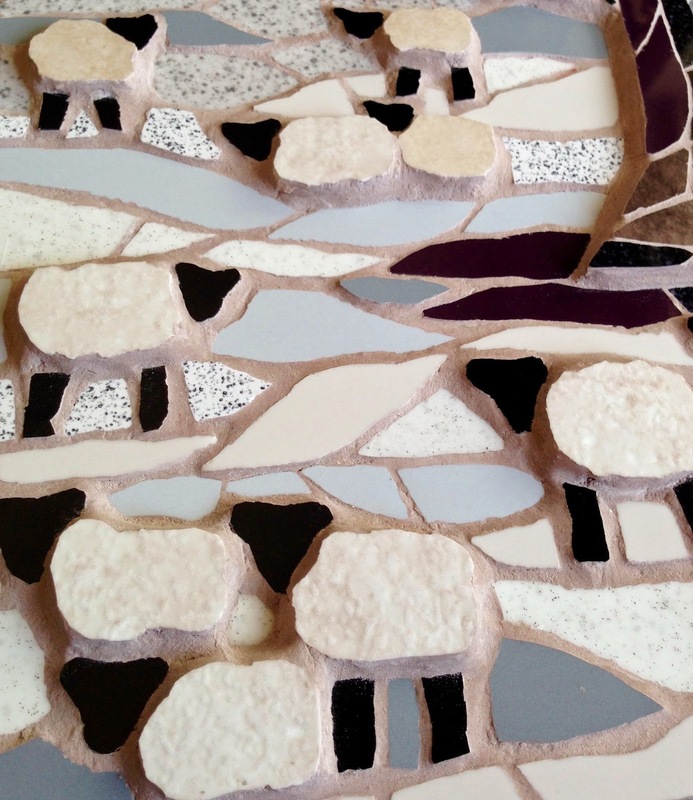 The making of my mosaic, 'Sheep in Winter'. 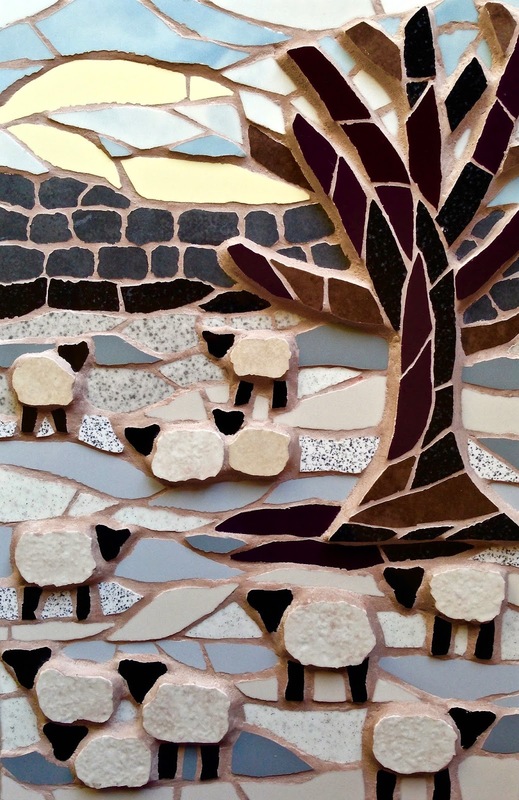 There is never a dull moment with my mosaic work, and I love the variety! 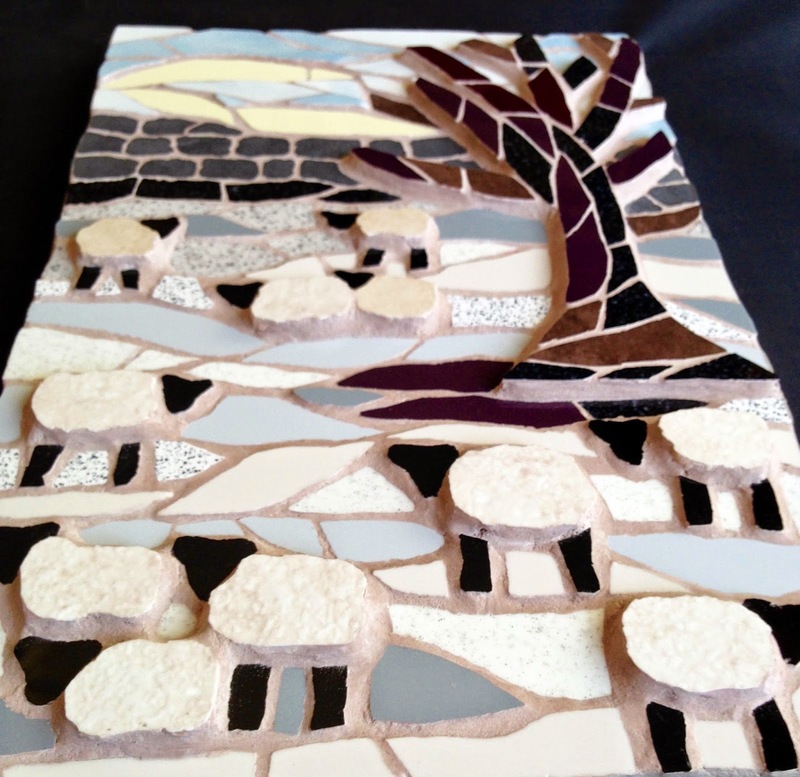 Last week, I was commissioned to make one of my 'sheep in winter' mosaics. This is one of my personal favourites as I use a more subtle palette of colours - love the bright, love the pale! This mosaic is particularly 3D. I build the sheep and the tree trunk in plain white tiles first, and then add the coloured tiles on top. It really works well to bring the mosaic to life. 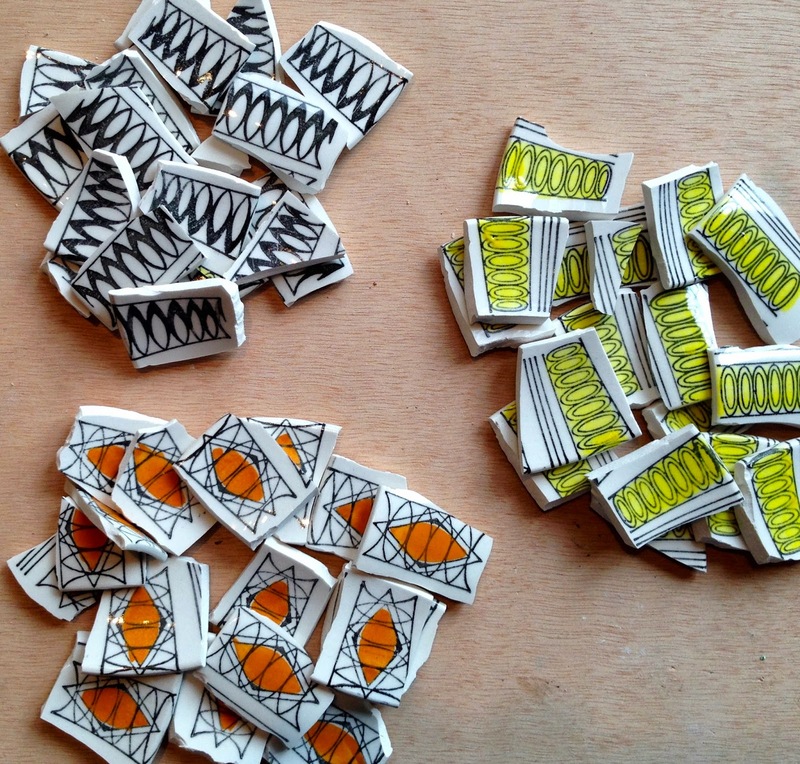 The other tiles I have chosen are all different widths so bringing a lovely texture to the whole piece. The sheeps' heads and legs are only one tile thick so giving the effect of a big wooly body coming out at you. As you can imagine, better in real life, but I'm trying to give you some idea of how it is! These photos probably do a better job. I hope you like 'Sheep in winter' and thanks once again for reading my blog. I know you are all out there as my stats tell me loads of you read, so do leave me a comment - it would be lovely to hear from you! Making a mosaic using vintage tiles. The Easter holidays are upon us here, blogger friends - so usual routine is out of the window. It's good to have change sometimes though, isn't it? As the children are older now, I am able to get quite a lot of work done in the holidays, which is great - though I have to be ready to stop at any moment to sort something out, or be a taxi for someone. That's OK - that's part of the deal! From time to time, Sue from Yay Retro www.yayretro.co.uk kindly gets in touch about some vintage china she has, and I might be interested in for a mosaic. I received a box from her this week to find cups and saucers and I was able to get these lovely pieces of china from them. They are very delicate to snip and often just shatter when I approach them with my snippers! Sometimes, I'm not sure what to make with special tiles like this, but with these I just knew straight away - a mosaic teapot wall hanging, and a big one too - 35cm x 35xm! I just love the shape of teapots. So I drew out my friendly teapot design, and asked my husband to cut it out in thick MDF so it would have a chunky feel too. When he came back from the garage with two teapot shapes for me, he said - "Mmmmm - not the easiest ....!" It took a lot of thought how I was going to use the tiles - I only had a limited number - hotchpotch, a pattern ..... ?! In the end I chose three contrasting plain coloured tiles as well to complement the lovely vintage tiles. As I was making it, I had that tell-tale excited feeling that I have when something is going well, and that good feeling it is going to turn out well. 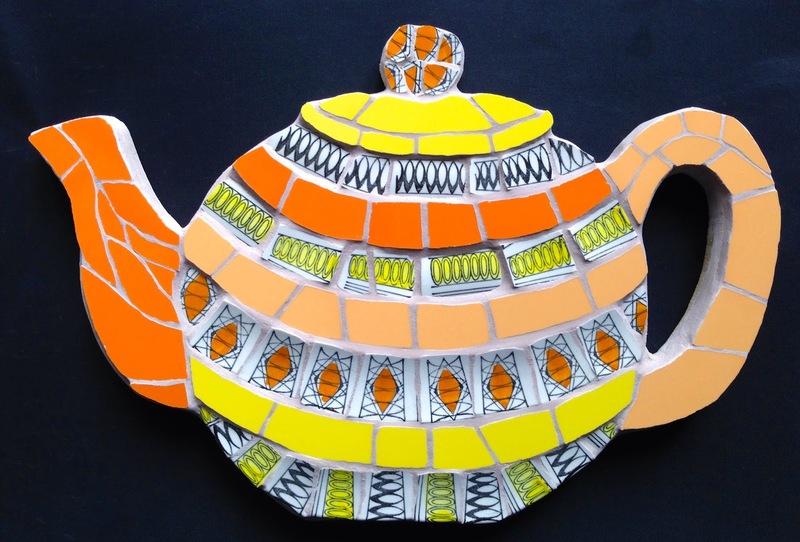 And I was right - I really am so pleased with my vintage mosaic teapot! What do you think?